Purchasing, licensing or subscribing to accounting software is sometimes not a pleasant experience. Oh heck, let’s buy from the company with the persistent salesman that keeps calling asking if we’re ready to buy because they are running a 20% discount special this month which expires soon. Recognize any of the problems above? I won’t say that they happen in every ERP selection process. The exception may be users who’ve previously worked with a particular system, left their job and taken another where they will then purchase or license the same solution. Others starting fresh in their search for an ERP system tend to make the same mistakes over and over. Here’s a quick summary of the top 5 problems that can arise during your RFP or evaluation of a new system. Ten of fifteen years ago companies would buy generic accounting software and force it to fit into their business processes. Fast forward to today and there’s little reason to force a square peg into a round hole. Solutions exist for nearly every type of business. Do you haul waste? Run a lumber yard? Sell inventory from multiple warehouses? Need to track projects? There are multiple solutions which have been built specifically for your industry. Key tip: Ask the consulting firm how many customers they have that are in your specific industry. Then get names and check references. Consider it a huge red flag if the consulting firm is unable to name names. A Google or Bing search will uncover dozens of names of consulting firms. What’s more relevant than just compiling a list of names is to know the extent of the recent experience those firms have with the solution you’re considering. Key tip: Look for experience in your industry. If you are selling diamonds or groceries or fuel oil – the only relevant experience is that provided by a consultant to a company in your same industry. 3 – Promised Integrations – Don’t. Or They Integrate Poorly. The biggest landmine, and point of failure, for almost every complex ERP implementation is the quality of third party integrations. In many cases you’ll be using third-party enhancements which perhaps allow for multi-company or cash basis operations. Sometimes enhancements are purchased that add full Warehouse Management (WMS) or Electronic Data Interchange (EDI). Don’t be fooled by the promise of integration ease. Ask the person who is selling or recommending the integration how many systems they’ve integrated to. The systems should be the EXACT type which you are considering purchasing. Key tip: Third party developers are sometimes over-confident. It’s not unusual for them to over-promise in order to get the sale. Once sold, the integration is often under-delivered. Do your homework and verify how many integrations the developer has made and how happy the users are with the integration. In today’s market most companies looking for a new ERP should go through a paid proof-of-concept. This is a setup of the system using your companies data and some test transactions. If you rely on a free demo, free evaluation and free meeting then you’re really only getting a sales pitch. This leaves you to do 100% of the critical analysis. Key tip: When you’ve relied solely on a free demo you’ve really only gotten a sale pitch. Do not expect any critical information to help you make an informed decision. Google or Bing are wonderful search engines. If your needs are simple and only require GL/AP/AR with no integrations or unusual concerns then by all means Google or Bing for the cheapest accounting software. All others should ignore anything labeled “guaranteed lowest price”. The prices are low for a reason and it’s often that these companies are focused solely on selling, winning Presidents Circle trips and selling you some more. Get off on the right foot with a more focused selection that zeros in on your company’s key success factors and not the sales goals of a consulting firm trying to make a sales quota. Forrester Research has an interesting study predicting that up to 25% of companies might be in the market for either upgrading or completely changing their accounting system. What’s interesting about this news post is there’s no clear direction that companies are headed. The decision between a SaaS (software as a service) offering which is hosted off-site and an on-site offering is, according to this article, largely made on a company by company basis. An ERP boomlet, born of necessityFor the past decade, ERP has been the poster child for IT projects that overpromise and underdeliver. It was notorious for painfully complex rollouts that took years to implement, required massive customization, and were often only partially realized. Billions of dollars were spent just trying to get ERP systems to work as advertised. Now ERP is back — and not just for big enterprises looking to refresh legacy systems. According to surveys by Forrester Research, roughly one out of four SMBs and enterprises plans to either upgrade their existing ERP solutions or implement a new one over the next 12 months. Many of these are small to midsize companies that have been getting by for years with QuickBooks or Peachtree but now need to take managing their businesses to the next level, says Forrester Research analyst China Martens. Interested in viewing a free demo of Sage ERP MAS 90 or 200 – without having to schedule a convenient time for several people to meet in your conference room? You’re in luck! 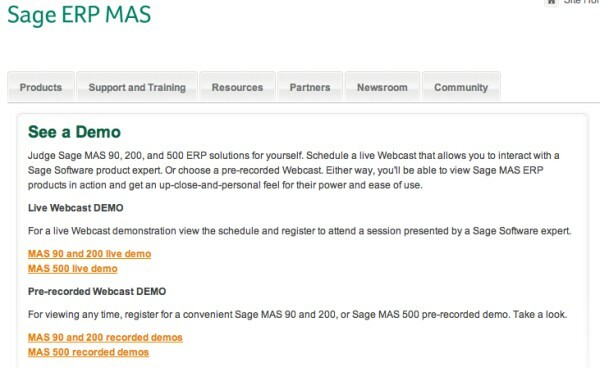 Sage has a site where they list both live and recorded versions of their most popular Sage ERP MAS 90 and MAS20o demonstrations. 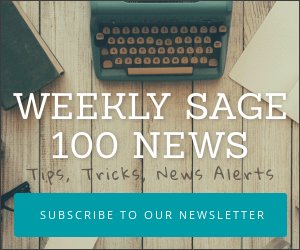 What’s New In Sage ERP MAS 90, MAS200 Version 4.50? Sage is now shipping their latest upgrade to Sage ERP MAS 90 and 200. This latest version 4.5 includes enhancements to payroll, sales commission processing, job costing, SageCRM and more. The new release started shipping September 8, 2011 to new customers. 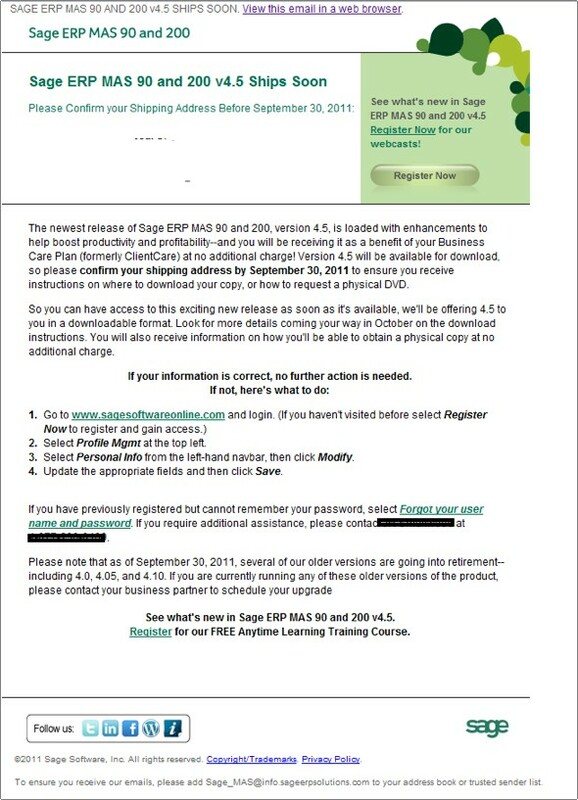 Sage have begun sending out announcements and encouraging existing users to update their records in anticipation of an October 2011 release to their existing users. Here’s a look at a summary of new features included in Sage ERP MAS 90 , MAS 200 and MAS 200 SQL.